The Port of London’s established deep water terminal at Tilbury attracts the latest and largest of the ever-growing luxury cruise ships designed to attract a more diverse cross section of punters full of visitor attractions, as featured in the media. The smaller, conventional and classic in design ‘Europa’ visited Greenwich’s mid river ‘Welcome’ floating terminal being just off Deptford Creek with its ever-growing rash of high rise apartment blocks. In pre-war days German liners called just here which, in those days was a hub of maritime activity with working wharves serviced by flotillas of lighters and Thames barges navigating all the way up the tidal Creek as far as Deptford’s towering flour mills and granaries. Ship yards and warehouses served the East India Company and later the HQ of the General Steam Navigation Company founded by a local timber company in 1869. From here they operated a fleet of coasters serving the continent and Mediterranean ports and UK coastal ports. This was the home port for a famous fleet of paddle steamers which plied from Tower and Greenwich piers down river to similar piers including Rosherville, a purpose-built garden resort at Gravesend, which had remarkable views of shipping that filled the estuarial reaches to the ports of the world. Nowadays, trial commuter services are being successfully run by the new Thames Clippers to and from Gravesend, Canary Wharf and the City. Way back, in art school days, I took a summer job as a deck chair attendant at Clacton on Sea. I was expected to have my stock ready for the hordes of trippers arriving on board the Golden Eagle inbound from London. My problem was to clear the beaches as high tide approached to cover them. I devised a method of flight on to the sea wall next to the hut, so deck chairs remained dry! Later, while at Regent Street Poly, a summer outing to sunny Southend was much enjoyed, providing my first sight of Greenwich from the river which I will treasure. Surrounded by rowdy students, I glimpsed the waterfront and the Crane Street house where I now write and sketch – Hurrah!! Even more joyous memories as the Scottish paddle steamer Waverley on her annual visit to our tidal attractions – loaded to the gunnels with day trippers – approaches, the distinctive beat of her willing paddles announces her passage and a rush to the window as she proudly steams by. The Port of London’s established cruise ship terminal at Tilbury celebrated its largest and longest vessel to ever come alongside. The newly-built German tourist ship ‘Mein Schieff 3’ towered over the landing stage; while here at Greenwich Tier, another German ship ‘Europa’ rested at a mid-river mooring which was a pre-war favourite just off Deptford Creek. A medium size cruise ship, ‘Europa’ has the classic styling and ambiance favoured amongst conventional passengers of yesteryear. Indeed, it was also a regular port of call for pre-war shipping and, no doubt, photographed and documented pre-blitz! 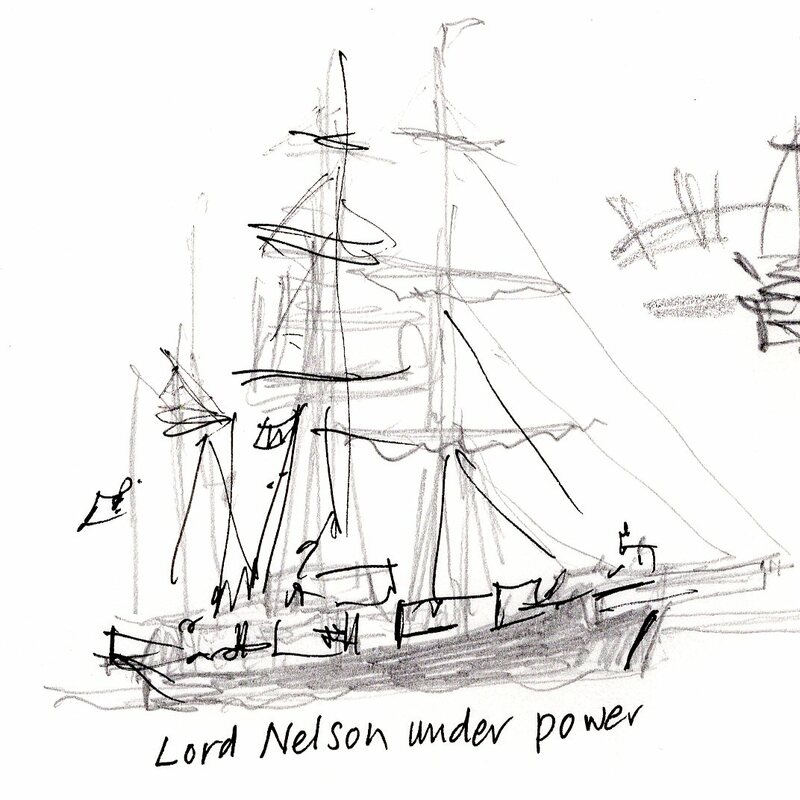 Just as I was heading off to the O2 ‘Lord Nelson’ slipped past, crowded with crew and supporters including two red uniformed Chelsea Pensioners no doubt viewing how the other half once lived in the ORNC on the South Bank here at Greenwich. Then my monthly inspection of The O2 and the Peninsula to keep an eye on the rapid changes of new high rise structures, and got home just in time to see ‘Europa’ slide by outward bound.